The Glen Ellyn District continues to work to improve your parks and facilities. Listed below are projects that are currently in planning or construction phases, in addition to recently completed projects. For 2017 projects, those are still subject to bid results. If you’d like to know more about any of these projects, please contact the Superintendent of Parks and Planning at (630) 942-7265. 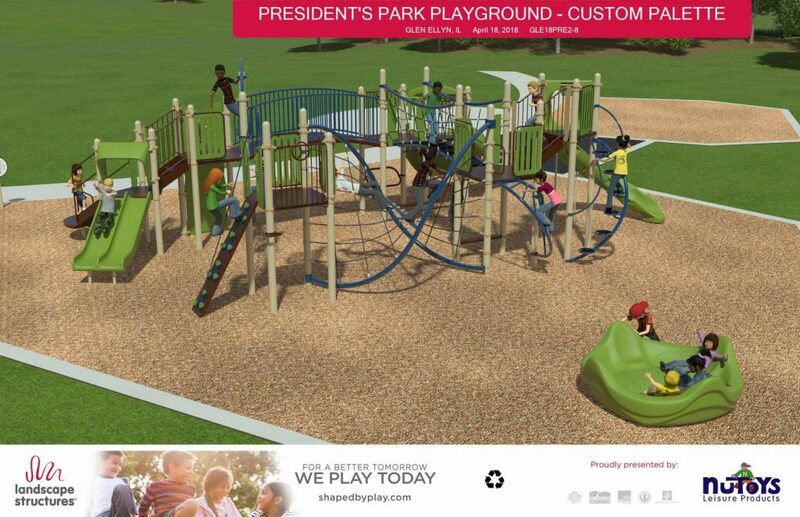 Please click here to learn more about the Ackerman Park improvements planned for 2019. The access road at Churchill Park will be rebuilt in spring 2019. The project, originally schedule for 2018, was delayed due to weather conditions. Please check back for additional updates. The Park District has been working in collaboration with nearby residents, Golden Eagles, and Bulldogs lacrosse on implementing a parking plan for Newton Park. The goal of the plan is to direct patrons of Newton Park to park in the lots within the property and away from the residential streets. Improvements will be implemented within the park to assist ingress/egress as well as connectivity. This includes the construction of a vehicular turnaround at the south end of the west parking lot. Additionally, a walking path will be added between the east lot and the central area of the park, near the restrooms and concession facility. The District recognizes that the lots are in need of repair and they were included in the capital improvement plan within the next five years. The turnaround and walking path are tentatively planned to be constructed in the summer, 2017. The parking plan will be implemented this April after spring break. The new parking lot at Ackerman Sports & Fitness Center was completed in September 2018. Improvements included resurfacing and repair of the lot, lighting improvements, and bioswales to reduce runoff volumes and improve stormwater quality. Glen Ellyn Park District was successful in receiving a $439,290 Illinois Green Infrastructure Grant (IGIG) through the Illinois Environmental Protection Agency in October 2014. Those funds, which were to offset the cost of the parking lot improvements, continued to be withheld by the State of Illinois. While short-term improvements had been made in the interim, the Park Board approved moving forward without the grant at the May 15, 2018, meeting. Lighting improvements within parking lot and entrance road, including conversion to dark sky and L.E.D. The 44,000 square foot lot serves over 250,000 annual users of Ackerman Sports & Fitness Center along with many additional patrons that utilize the surrounding 65 acres of open space, natural areas, and athletic fields. While benefitting the water quality for the East Branch DuPage River, the implementation of these measures will also provide and model responsible and innovative environmental practices in a highly visible and heavily utilized area. Weekly updates on the project were posted here as they became available. Path improvements were completed on the south end and east side of the lake. A new path along the west side of Lake Ellyn Park, parallel with Lenox Road, was added in partnership with Village of Glen Ellyn. In addition, new landmark, informational and interpretive signage was installed in the park, thanks to an anonymous donation. The replacement of the Main Street Recreation Center playground was completed in early October 2018. The original playground was built in 1997, but due to age and popularity, had begun to fall into disrepair. Look for additional improvements, including benches and new garbage cans, in the near future. The replacement of the Marie Ulhorn/President’s Park playground was completed in early October 2018. The original playground was built in 1993, but due to age and popularity, has begun to fall into disrepair. The District once again collaborated with Kids Around the World, who removed the existing playground and will repurpose the old equipment to be used in a less fortunate community. Look for additional improvements, including benches and new garbage cans, in the near future. Drainage system improvements were completed at Village Green Park in 2018. Four (4) additional basketball goals were installed on Court 2 and new cardio equipment was added in the Fitness Center. In addition, new graphics were installed in the lower level hallway, party room, and in the indoor turf area. A new shade structure was installed at Splading Park in 2018. Two additional courts were completed in October, 2017. The Glen Ellyn Platform Tennis Club is contributing nearly half ($100,000) of the total cost with the remainder being offset with operating revenue from the two additional courts within six years. This will allow the facility to serve the increasing growth of women, youth, house league, open play and travel. The tennis courts at Village Green park were improved this summer/fall. In addition, in order to better accommodate the growing demand for Pickleball, one of the courts was convered to four Pickleball courts. The Glen Ellyn Park District Board of Commissioners approved construction bids at the February 21st Park Board meeting for elements related to implementing phase III of the Lake Ellyn Park Master Plan. The project included replacement of the 1991 playground; park amenities such as energy efficient L.E.D. pathway lights, park benches, bike rack, picnic tables, trash and recycling receptacles; a fishing pier in the northwest corner; vegetative restorers (small islands near the inlets which will filter and cleanse incoming storm water); interpretative signage; realigned paths in southern portion to expand green space closer to the lake and landscape. This followed Phase II, which was completed in 2016, and involved the historic restoration of the Boathouse and improvements to the central corridor of the park. Replacement of the playground, path reconfiguration, the addition of a fishing pier and other park improvements were to be included at that time but were deferred as a significant source of funding ($400,000 OSLAD matching grant) was suspended by Governor Rauner upon taking office. Phase II, minus the OSLAD elements, was completed on time and under budget in July, 2016. The project has since received national historic recognition, local landmark designation and Gold LEED certification. Phase III construction will began in spring, 2017, and was completed in mid-June. Parking lot improvements were made at the Spring Avenue Recreation Center. Work included resurfacing of lot, sidewalk/curb repairs, and providing a paved entrance to the Spring Avenue Dog Park. Repairs were also be made to the Dog Park entrance/exit gates and new agility dog equipment will be added. As part of the playground replacement program, the playground at Lake Ellyn Park was replaced in 2017. 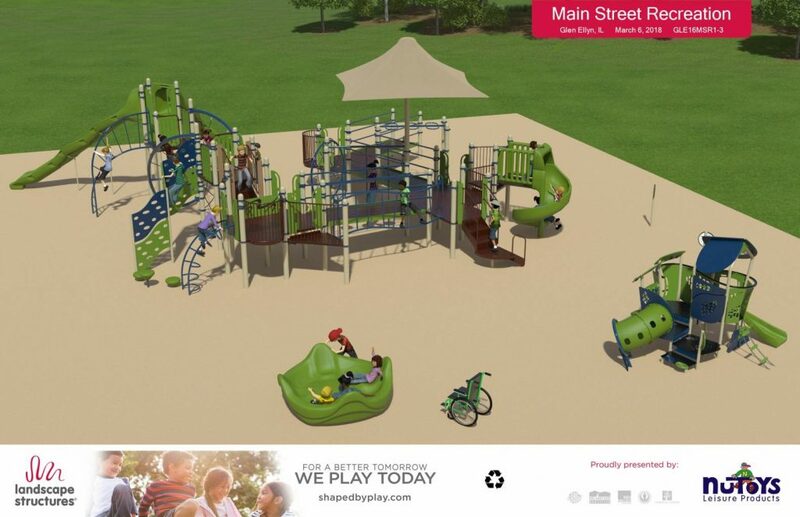 In 2018, the Main Street Recreation Center playground is scheduled for replacement. The District has 21 playgrounds and it is the long-term goal to replace one playground per year as the useful life of a playground is 15 – 20 years. The athletic lighting for the lower Ackerman athletic practice fields was updated to accommodate reconfigured field layouts while modernizing antiquated fixtures which are well pass their useful life. The improvements will result in reduced maintenance costs; provide flexible field configurations and usage while improving park safety and security. The project was completed in February 2017. Significant improvements to Lake Ellyn Park began in September, 2015. The $2.9 million capital improvement project concentrated on the restoration of the Lake Ellyn Boathouse, including replacement of the roof and deck, realignment and remodel of the restrooms, creation of front entry way and hallway, replacement of HVAC system, complete infrastructure overhaul and flood control wall. The project also included landscape enhancements and a standalone restroom near the playground. Click here to see more information. The Glen Ellyn Rotary Club provided a $10,000 grant which contributed to improvements to the park. The Park District, the Glen Ellyn Library, and the Village of Glen Ellyn collaborated with the Rotary Club to install a StoryWalk™, an outdoor ping pong table and a chess table. Additionally, landscape improvements were completed. Thank you to the Glen Ellyn Rotary Club for their financial and in-kind donation! The carpet for both golf courses (36 holes) was replaced in late spring. The carpet has a limited life expectancy and the surface was past its useful condition. Energy-Efficient Regenerative Filters for the zero-depth pool were installed this spring. The new filtration system replaced the traditional and original filter system, which will result in reduction of water and energy consumption while also improving clarity. The lap pool system was changed similarly two years ago. The lap pool was also painted in the spring and the zero-depth pool is scheduled to be repainted this fall.